Do you like walking and real ale? Then let us take you on a journey along the 'Inn Way to the Lake District', a 90-mile circuit through the finest Lakeland scenery, calling at its best pubs. The walk is the creation of guide book author, Mark Reid, and beginning in Ambleside heads via Grasmere to Borrowdale, before wending its way through the dramatic mountains and valleys of western Lakeland. The return to Ambleside is via the quintessential Lakeland village of Coniston. The aptly named ‘Inn Way to the Lake District’ is designed to pass more than 40 traditional Lakeland inns. Wandering Aengus Treks have arranged an itinerary of the ‘Inn Way to the Lake District’ which allows for a stop at a pub each lunchtime and where each evening, you stay in one of Lakeland’s traditional inns or within easy walking distance of a traditional pub. Prices are per person based on twin share and include: all accommodation in twin share rooms on bed & breakfast basis; luggage transfer; a Wandering Aengus information pack containing all required maps, Mark Reid's guidebook, laminated information sheets giving details of local facilities, places to eat etc. ; and our emergency contact. Situated at the northern end of Windermere, Ambleside is the ‘capital’ of South Lakes and there is lots to see and do here. The Bridge House is a must-see and there are options for short walks, including ascents of nearby Wansfell or Loughrigg for views over the town and the lake. Ambleside also contains several traditional Lakeland pubs. From Ambleside the Inn Way follows good trails past Rydal Water and Alcock Tarn before descending to the Swan, a 17th century coaching Inn mentioned in one of Wordsworth’s poems. The centre of Grasmere also contains several options for pub refreshment. From Grasmere you head up into the wild reaches of Far Easedale and cross Greenup Edge before descending into the beauty of Borrowdale. 13 miles. Total ascent: 900m. Highest point: 610m. After first climbing to the summit of High Spy and following a high ridge overlooking Derwentwater, the Inn Way crosses to the Newlands Valley where it visits the lonely Swinside Inn, before circumventing Barrow Hill to reach the small village of Braithwaite close to Keswick. 12 miles. Total ascent: 900m. Highest point: 653m. Today you cross to the Buttermere Valley by way of Coledale Hause between Hopegill Head and Eel Crag. Descending the flanks of mighty Grasmoor beside the tumbling Liza Beck, you reach the northern shore of Crummock Water. This is a relatively quiet corner of the Lake District and here, a visit to Loweswater and the special Kirkstile Inn provides the perfect place to stop for lunch. The Inn Way now leads along the quiet western shore of Crummock Water to Buttermere Village where you stay overnight in one of Lakeland’s famous inns. 11 miles. Total ascent: 620m. Highest point: 630m. The route of the Inn Way follows the western shore of Buttermere to its southern tip before climbing steeply at first then more gradually, up to the main weakness in the bounding ridge between the valleys of Buttermere and Ennerdale. This is Scarth Gap, a high place surrounded by lofty peaks. From the pass the route descends to Ennerdale and passes the remote Black Sail Hostel before climbing again to the next watershed between Ennerdale and Wasdale. Crossing this watershed at Black Sail Pass, the Inn Way now descends directly to the Wasdale Head Inn, one of the most famous inns in UK mountaineering history and a welcome place to take lunch. This afternoon’s walk sees a character change in the landscape as you leave the rugged volcanic peaks and climb up onto Eskdale Moor and pass the lonely Burnmoor Tarn before descending to Boot at the head of remote Eskdale. Hardly more than a collection of farms and a few cottages, surprisingly Boot has three excellent traditional Lakeland Inns. 12 miles. Total ascent: 850m. Highest point: 550m. Today’s walk takes you cross Ulpha Fell and through Dunnerdale Forest to reach the 16th century Newfield Inn in the Duddon Valley. After the opportunity for some refreshment you cross the rugged pass beside Brock Barrow and descend the Dunnerdale Beck to the tiny hamlet of Broughton Mills where it will be difficult not to make the short detour to the excellent Blacksmith Arms. Now follow the River Lickle on a mix of field paths, quiet roads and farm tracks to the main A595 which you follow for half a mile into Broughton-in-Furness which boasts no less than four real ale pubs. 14 miles. Total ascent: 670m. Highest point: 355m. The majority of today’s walk follows quiet lanes, farm tracks and well-defined moorland and field paths. You begin with a traverse of the marshes of the Duddon estuary. The route then climbs onto the Blawith Fells and to the isolated Beacon Tarn offering excellent views of the Coniston Fells. A descent from the tarn brings you to Torver where there is a choice of two fine traditional pubs for a lunch stop. Following the Torver Beck upstream leads to the Walna Scar Road which is one of the oldest in the Lake District, constructed by the Romans as a packhorse route to transport copper from the mines at Coniston to the port of Ravenglass. You end the day with a stroll along this ancient monument with superb views over Coniston Water. The village of Coniston maintains its character as a traditional Lakeland town despite being one of the most popular destination for visitors. 13 miles. Total ascent: 550m. Highest point: 340m. Today is a sensational climax to the Inn Way, which begins with a walk through the Coppermines Valley. Climbing up beside Levers Water and along the arête of Prison Band, the Inn way reaches its high point on the summit of Swirl How at 2630ft. After traversing Great Carrs (looking out for the remains of the wartime plane which crashed on its slopes), you descend Wet Side Edge to the Three Shire Stone on the road to Wrynose Pass. 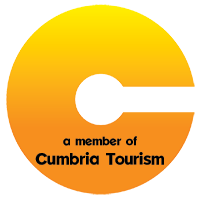 This is the point where the old counties of Cumberland, Westmorland and Lancashire met before they were amalgamated in 1974 to form the brand-new county of Cumbria. From the stone, a good path climbs up to Red Tarn on a saddle between Cold Pike and Pike O’Blisco . Crossing this pass, you now descend to Oxendale with superb views of the Langdale Pikes and follow the beck to the Old Dungeon Ghyll Inn which like the Wasdale Head Inn, has a long association with British Mountaineering. The 8 day / 9 night option spends a night here. For the final 7 miles,the walk continues first to the New Dungeon Ghyll Hotel, so called because it was built only a couple of centuries ago, and then follows the Langdale Beck to the Britannia Inn on the village green at Elterwater. The climb out of Elterwater takes you first to pretty Loughrigg Tarn, then across the flanks of Loughrigg Fell. Cresting the ridge you get a birds eye view of Ambleside and Windermere lake before a final short descent to your final night’s accommodation. 13 miles. Total ascent: 1130m. Highest point: 802m. As keen walkers ourselves we appreciate the importance of the place you put your feet up and rest your head in at the end of each day. We very carefully select our accommodations whether they be a cosy pub, family run guest house, or established town centre hotel. We choose places directly on the route or within easy walking distance of it and if we ever have to transfer you because of limited availability, we will always contact you to discuss this and never just leave you to find out later. We provide comfortable, clean and warm twin or double rooms, with private bathroom wherever available. Single occupancy of rooms is also available for a supplementary cost. For the Inn Way, we always try to accommodate you in a traditional Lakeland Inn whenever this option is available to us. Ambleside is easily reached by taxi or the regular 555 bus service from Windermere station. 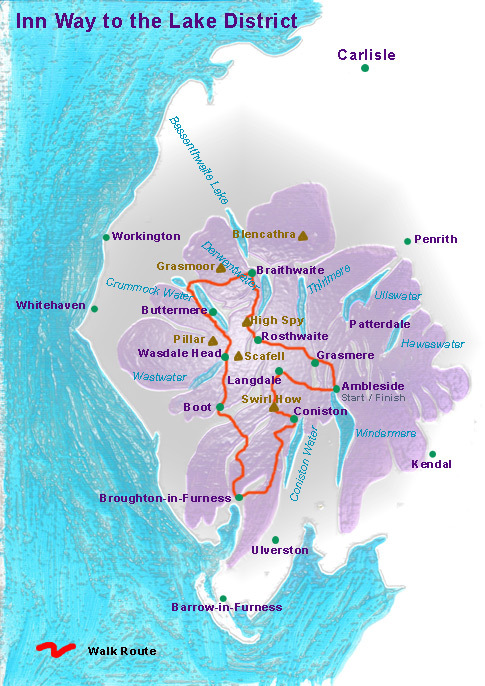 Windermere is the terminus of a branch line from the main North-West London to Glasgow rail link (change at Oxenholme). Alternatively, if you are arriving by car it is usually possible to arrange parking for the duration of the walk (possible extra charge). The 'Inn Way to the Lake District' generally uses mountain passes to cross from one valley to the next and is therefore not classed as a high level walk. Having said this, you will find yourself on some high ridges and at spectacular viewpoints. The highest point attained on the circuit is Swirl How at 802. Each day's walk is fairly full requiring 7 or 8 hours and it should be noted that the last day is longer and harder than any before it.